Dell announced the GA of Quest Recovery Manager for Exchange, Version 5.5. This version is ready to support Exchange 2013 mailboxes and archive mailboxes as well as Office 365 based mailboxes. The tool can be installed on Windows 2012 and Windows 8 and works together with Outlook 2013 as interface. A new Recovery Manager console GUI helps to search more detailed for strings in the mailbox stores. The deletion of items in writable storages is also supported. On Redmond Magazine, an article was launched that announces the new Version of QMM (QMM 8.10). The Software is not yet available for download (actual by May, 12th 2013), but promises the single-hop Migration from Exchange 2003 to Exchange 2013 which can make a difference for many large IT customers when comparing with Microsoft native approaches. With the actual version of Quest Migration Manager for Exchange®, migrating mailboxes from Exchange 2003 to Exchange 2013 will require a 2 hop migration process. You have to install an Exchange 2010 transition server into your existing Exchange 2003 environment. You will then perform a 1st hop as an Intra-Org Exchange migration to move the mailboxes to the Exchange 2010 server. 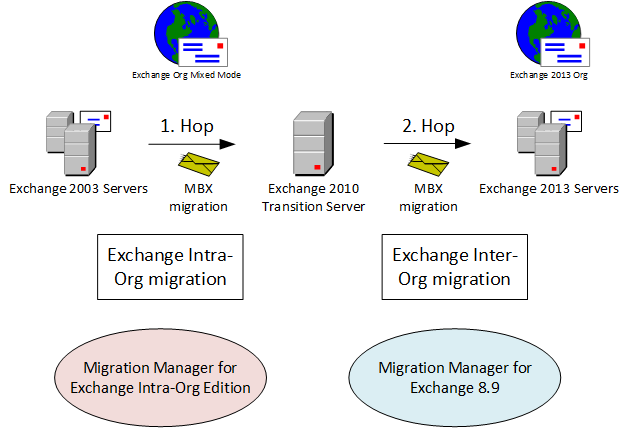 The 2nd hop will be an Inter-Org Exchange migration to the target Exchange 2013 organization. Although there is special software from Quest available to support the 1st hop, Migration Manager for Exchange Intra-Org Edition, the procedure is still a bit long winded. The plans of Dell/Quest Software are that the next version of Quest Migration Manager for Exchange will support a single hop migration from Exchange 2003 to Exchange 2013 in Inter-Org Exchange migration scenarios directly without the requirement of a transition server. The new version is awaited for Q2/2013.